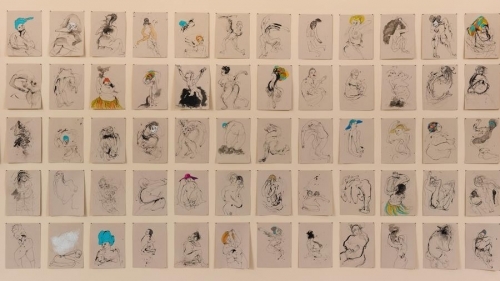 One hundred drawings by Kenyatta A.C. Hinkle of 100 missing African American women simultaneously startle and beguile. Their subject represents the tip of a statistical iceberg of almost unfathomable scope — thousands of black women disappear every year in the United States, whether through criminal activity or for other motives, but their names and faces most often remain obscure. At the California African American Museum, Hinkle’s notebook-size contour drawings in black ink on paper are rendered with a line that ranges from tremulous to direct, elegantly sinuous to jabbed or smudged. Her line is formally reminiscent of Egon Schiele, the early 20th century Austrian artist whose defiance of conventional norms of beauty unearthed a more powerfully charged inner life. But all her women evanesce — a double-edged word that the artist uses to describe her subjects’ fate. (Curator Naima J. Keith has titled the show “The Evanesced.”) Figures dissolve into the space of the sheet, like memories that fade or spectral shadows moving through a larger universe. At the museum, the drawings are unframed and simply pinned to one wall in a grid — five rows of 20 uniform sheets. Some papers slightly curl, others gently flutter with the subtle movements of air. Like butterflies pinned to be examined or notices tacked to community billboards, they ask for quiet scrutiny. The grid, a staple of Minimalist art, lends formal gravity and stateliness to intimate images of loss. The show also includes seven large paintings in black acrylic ink and paint on canvas. Each features a big figure drawing, stylistically similar to the ones on paper. Here the ground is painted what might be called “Crayola flesh tone,” the standardized, pinkish-beige crayon hue that co-opts an array of skin colors under a single approximation of Caucasian. The paintings evoke what the late journalist Gwen Ifill once termed “Missing White Women Syndrome,” as the disappearance of female African Americans evanesces into an oblivion determined by the dominant race. Hinkle’s juxtaposition of “black figure” and “white ground” is telling, even if the paintings finally aren’t as viscerally moving as the fragile works on paper.